In a dramatic turn of events, the ex-head of state has been ordered to appear as a witness in the corruption trial of his former party spokesman, Olisa Metuh. But he failed to show as trial continues. Olisa Metuh, former spokesman for the Peoples Democratic Party (PDP), is accused of fraudulently receiving 400 million naira ($1.1 million, 945,000 euros) from Sambo Dasuki, who was Jonathan's national security advisor. The money was allegedly used for Jonathan's 2015 failed re-election campaign, which he lost to Muhammadu Buhari. Metuh's legal team has already successfully sought an order for Dasuki to provide evidence in court. Former army colonel, Dasuki, is being tried separately. He is accused of illegally redirecting $2 billion in funds that were supposed to be used to arm Nigeria's military in the fight against Boko Haram jihadists. The money was allegedly given to high-ranking members of the PDP party. Dasuki has claimed that Jonathan knew about the purported corruption. Metuh's lawyer has also said that his client was following directions from Jonathan. Metuh's lawyers had announced on Monday that they intended to call Goodluck Jonathan as a witness. On Tuesday, Judge Abang Okon, at the Federal High Court in Abuja, said it would be "tantamount to violating the right of (Metuh) to (a) fair hearing not to sign the subpoena." "I have no option other than to sign a subpoena to compel former President Goodluck Jonathan to appear in court on October 25, 2017 to give evidence." Speaking with reporters outside the court, Metuh's lawyer, Onyechi Ikpeazu, said that the demand for Jonathan to stand as a witness was because "justice... demands all the cards to be placed perfectly on the table". Prosecutor Tahir Silvanus also spoke, saying: "We, the prosecution, have no problem with that." "We look forward to having them, both Colonel Dasuki and the former president, in court so that they can assist in moving the wheel of justice forward." This unexpected development will be closely followed, as Jonathan has been named in several corruption cases but has not yet been formally questioned. But as Metuh's trial continued Wednesday, neither Dasuki, nor Jonathan, appeared in court. It was not clear why Dasuki failed to show, as he is being held in custody by the state security service. The court registrar, however, confirmed that Jonathan's failure to appear was due to the fact that he had not yet been served the subpoena by court officials. Nigeria's Daily Post has reported that the bailiff must serve Jonathan with the summons within five days. President Buhari should not run for another term in office, ex-President Olusegun Obasanjo advised in a letter to Nigeria's head of state in January 2018. In an interview, he told DW why he published the letter. 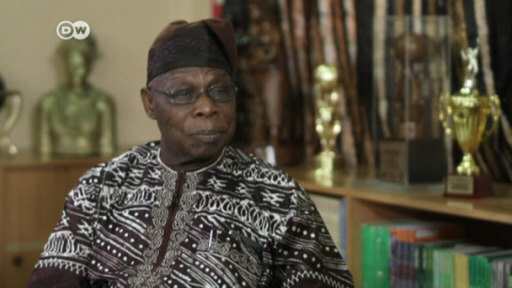 Former Nigerian President Olusegun Obasanjo has said current President Muhammadu Buhari has not lived up to expectations. "If you're fighting corruption away from you and near you corruption is becoming rife, then you have to also turn your attention inward," he told DW.